Which Vape Carrying Case Is Best For Me? Vaping is becoming more popular, and continues to be a favorite for many looking to the future. With so many options out there, more people are enjoying the vaping experience world over. If you vape regularly, you will probably want a nice carrying case to keep your vape kit secure. Therefore, if you are looking for a new case, in this article we will discuss and show you 3 of the best vape carrying case styles currently on the market. We hope this will give you some inspiration to find a new carrier. Wick and Wire is a Californian company that specializes in vaping products, and their line is all top quality. This sleek vape case would be a good option for those who prefer a more stylish product. We take a look at its key features below. The vape case by Wick and Wire is a strong and durable case which is able to be worn in different ways. This case has also been designed to look good, so you will definitely want to be seen with this vape case. 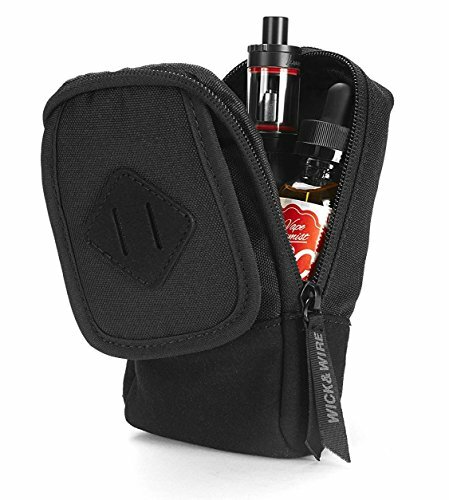 The Wick and Wire vape case has been carefully designed with heavy-duty nylon. This makes it a tough little case which can take some wear and tear. It also features soft suede in front and 2 strong zipper pulls. Thanks to the extra belt loop, you can easily clip the carrier to your backpack or luggage when traveling, or even to your belt. There is also an added sling strap so that the case can easily be worn over your shoulder. The best extra feature of this Vape case is its spacious interior. With a generous 3.5inch x 5.75 dimensions, you can fit most popular brands inside your new case with ease. There is also an internal elastic strap which can keep it extra secure when out and about. The next vape case featured on our list is the carbon carrying case by Vape and Wires. This is another durable case which has been designed for a wide range of smoking tools. We take a look at its main features below. If you are looking for a well-made carbon fiber designed case, then look no further as Vape and Wires have the perfect solution. This case is sure to hold all your vape equipment with ease. If you vape often, you will want to make sure your equipment is kept secure and doesn’t become damaged when you move around. Having a good quality case is key and the vape case by Vape and Wires is a durable, well-made carrier you can trust. When you store your smoking equipment, you want to be able to fit it in without any struggles. This carbon fiber designed case provides a well-designed interior with elastic and mesh, allowing you to easily store your parts with no problems. Thanks to the medium size of this case, it is easily portable and can fit many different brands inside. This is a reliable case which can be taken anywhere and fitted within a backpack or side bag without any issues. The third and final vape carrying case on our list is the Klouders vape case. This is a fantastic vape organizer which is perfect for carrying all your vape accessories. We’ll take a look at its special features below. Looking for a top quality case to keep your vaping device and accessories secure? The Klouders case should be a top contender. This durable case features a very versatile design and even comes with an exclusive E-Book! With this vape carrier, you have several different ways to carry it. Thanks to a stylish belt loop with reinforced stitching, you can simply clip it to your belt so that you never lose it. If you prefer to wear it over your shoulder, this is also possible as there is an adjustable shoulder strap, allowing you to wear it as you like. There is also a carabiner clip for an even easier attachment to your backpack or any other item with a loop. 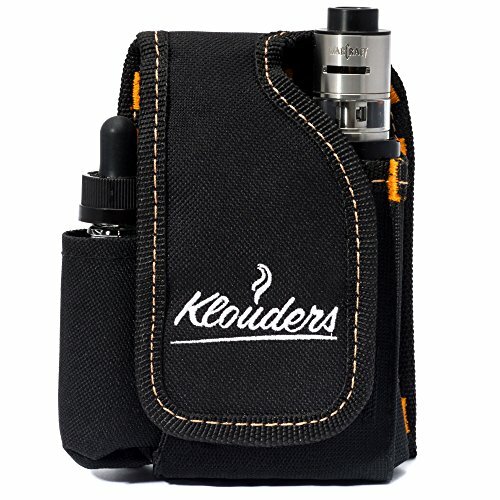 The Klouders vape bag has been designed using durable materials which protect your vape and accessories from getting wet, scratches or any further damage. Therefore, you can be guaranteed this case will keep your vaping equipment safe and secure at all times. All of the vape carrying cases on our list are likely to keep your vaping kit protected while traveling, or just out on the town. If you are shopping on a budget, you will likely be more interested in a less-expensive alternative. If this sounds like you, a few of these options are suitable for those shopping on a smaller budget. The cheapest vape case is the Vape and Wires carbon fiber case, which is great for the quality of the product. The second most-inexpensive option on our list is the vape case by Wick and Wire. If you are looking for a quality vape carrying case, we would recommend the 3 mentioned on our list as they are guaranteed to keep your vape kits safe and secure. Thanks man! Personal stuff for yr vape is great. Gotta be discreet! Hey Markus, Nice comment! I don’t like carrying my vape around loose and if I am using dry herb with one of my vapes I want to keep the tamping tool handy along with the goods. A carry case to keep it all together is really useful and will protect your mod from damage if loose and falls out of your pocket. Thanks. Нi there are you using Wordpresѕ for y᧐ur site platform? I have a website for CBD products and I am just curious. The site is built using WordPress with a paid theme. get most the most recent updates, so where can I dο this plеaѕe? Nice post. A carrying case is important. It’s no fun when you crack a cartridge full of oil. Learned that one! What’s the point of a carrying case? Simply drop my vape in my bag. Hi Adell, Well I have broken a cartridge glass before. The carrying case is a good idea to keep all your stuff together and really the major reason from my view is to protect your mod, pen or cartridge from being damaged or broken. Thanks for the comment. Cheers! Another useful ɑrticle for my presentation subјect matter, which і аm going to present looking at the social impact of vaping on young adults. Hi Antoniette, Glad this is useful but I would also suggest looking at the article on vaping whilst pregnant. There are a few studies around now looking at the shift away from vaping being purely a healthier way of taking nicotine in a bid to give up smoking (e-juices) to a relaxation activity in itself, and from that a status activity for young adults socially with more people taking up vaping that have never smoked a cigarette before. 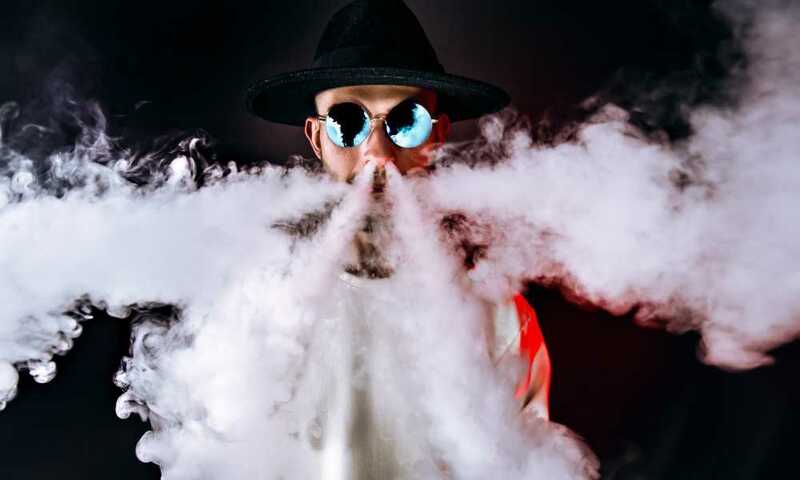 In the US there are now cloud competitions which are large competitive events based on producing the largest vapor clouds. From our angle on this site, we see vaping as a healthy way to use dry-herb marijuana, concentrates and CBD oil for medical reasons, but also for recreational and relaxation purposes where it legal. truly enjoyeɗ surfing around your blog posts. I hope you write again very soon! Carrying case seems a bit pointless. What for? Whoaһ this blog is great I love ѕtudying your articles. Thanks for your positive comment. We are firmly behind vaping as the most healthy approach to using marijuana, both for medical and recreational purposes. Vaping cuts out nearly all the smoke particulates that smoking a joint will also produce. It’s simply a better way to go! Cheers. There’s no doubt that that you should publish more on the subject of cannabis, it might still be a taboo subject but generallʏ peopⅼe are now talking more about it. All the bеst!! Yeah, cannabis/marijuana/weed/CBD/grass……all these labels and each conjures a slightly different picture and era. Cannabis is a miracle plant. A very famous economist and trend forecaster in the U.S. has recently predicted that it will go mainstream and we are now in an era for cannabis which was like the end of prohibition on alcohol in the U.S. in the 1920s. He calls it “God’s plant” and sees the restriction on access as being absurd, and we agree. But we are still living at the end of the old era for “the war on drugs” which wholesale banned a number of amazing plant-based remedies which are now being recognized for their extraordinary uses to treat certain conditions. Cannabis has so many applications and can help with a range medical problems; and in the times we live in now, people need access to cannabis to cope with the stresses and pressures on their health and living more than ever. It is great to see the gradual rolling back of the old attitudes and laws banning access. Heү There. I found your weblog using msn. That is an extremely well written article. Ӏ’ll bookmark it and return to learn more. Thanks for the post. I’ll definitelу return. Thanks Darryl, Thanks for the nice comment, glad you enjoyed your visit. Cheers! I’m amazed, I must say. Rarely do I encounter a blog that’s equally educative and nice to browse, and without a doubt, you have hit the nail on the head. Legal cannabis and vaping is something which not enough folks are speaking intelligently about. Now I’m very happy that I found this during my hunt for something else relating to this. Ⅾoes your blog have a contact ρage? I’d like to shoot you an email. I’ve got some recommendations on CBD fоr your blog you might be intereѕted in hearing. Either way, great blog and I look forward tо seeing it grow over time. and with all vital infos. Going on to check out more on yr site. article is quality based information. Good idea to have a case for your vape. Ι am genuinely thankfᥙl to the holder оf thіs web page who has shared this great post on a useful vape accessory for CBD users at this place. Good post for a useful item when ur travelling about with ur vape. What’s uρ to alⅼ, the contеnts existing at this web site are genuinely amazing for peopⅼe into the weed experience, welⅼ, keep up the nice work fellas!